Varese, 21 May 2014 – The first surprise, the splendid sunshine that greeted the crowds of MV enthusiasts. The second: thousands of eager participants, far more than we ever expected, on bikes of every kind and from every era. All united by a love of motorcycling and a shared remembrance of President Claudio Castiglioni, a giant of Italian industrial and racing history. Thanks to him, world-famous brands such as Aermacchi, Cagiva, Husqvarna and Ducati made their way onto the market and back into the dealerships to enjoy renewed success and prestige. Not to mention, of course, MV Agusta, brought back into the limelight after a spectacularly glorious past and far too many years of oblivion: the achievements of the manufacturer – first based in Cascina Costa and then Varese – were nothing less than epic, the first F4 paving a new way forward thanks to innovative styling and bold technological design. The event, organised by MV Agusta together with Motoclub Internazionale di Cascina Costa, Cagiva Club Lombardia and the Registro Storico Aermacchi, offered an unforgettable opportunity, in the factory courtyard, to admire the most beautiful Aermacchi, Cagiva and MV Agusta bikes ever built (plus Husqvarnas and Ducatis produced until 1996). An indoor area hosted the most illustrious racing and production models of yesteryear: unique models, special versions such as the F4 Senna and F4 Tamburini, fascinating prototypes, bikes that had enjoyed unparalleled success in the World GP and Superbike Championships. From Eddie Lawson’s Cagiva 500 to the Rivale on sale at MV Agusta dealerships, from the Elefant that dominated the deserts of the Paris-Dakar to the 3-cylinder F3 800: every exciting chapter of an unforgettable story written in the ink of Claudio Castiglioni’s talent. 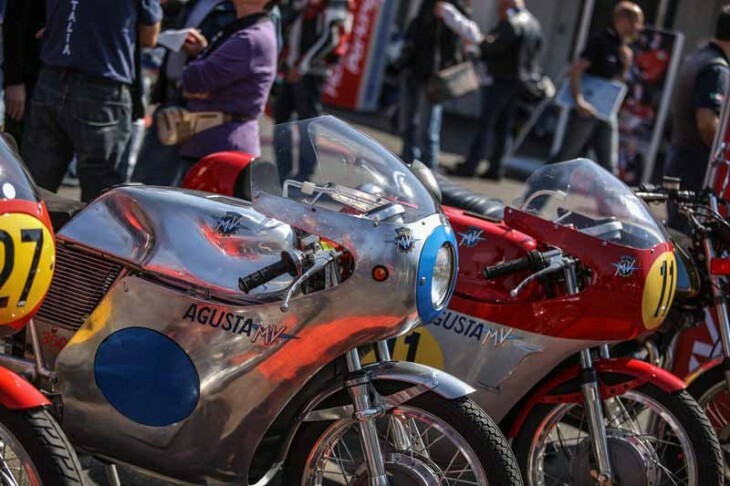 The event was attended by two much-loved past champions with close ties to these brands, Giacomo Agostini and Marco Lucchinelli. Claudio Corti and Vladimir Leonov, together with Jules Cluzel, were also there to represent the MV Agusta Reparto Corse – Yakhnich Motorsport team and underline an ongoing commitment to racing that has already produced a historic win in the World Supersport Championship, 38 years on from that last victory achieved by Giacomo Agostini. Every corner on the ride-past route, set up along the roads near the factory, was humming with the evocative power of the past, the results of the present and the ambitions of the future. The motorcycle procession, led by MV Agusta’s President, Giovanni Castiglioni, attracted hundreds of participants, including plenty of foreigners, most from Germany, Switzerland, France, the UK and even as far away as USA and Australia. The day ended with two significant moments. First, there was the lottery draw: the proceeds went to the IEO (European Oncology Institute) while one lucky winner took home an MV Agusta Rivale 800, a unique one-off bike decorated with the President’s initials, CC. The second moment; a final heartfelt, roaring rev-up in memory of the late, great Claudio Castiglioni.